ROSELAND, NJ--(Marketwired - Jun 24, 2015) - As the implementation of the Employer Shared Responsibility provisions of the Affordable Care Act (ACA) approached, some industry observers predicted that employers would move many employees working 30 to 34 hours per week into higher or lower hourly categories to manage health care benefits costs. However, a new study from the ADP Research Institute® indicates little to no change in the number of workers within each of three hourly ranges studied since implementation of ACA provisions began. The big question has been whether employers would change their hiring practices due to the ACA. Some commentators expressed concern that employers would cut hours for part-time workers, while increasing the hiring of part-time workers with schedules that call for under 30 hours worked per week. To date, study results show that this has not happened. The study, The Affordable Care Act and Economics of the Part-Time Workforce: Measuring the Impact of the Affordable Care Act, suggests that the actual impact of the ACA on employment policy appears to be negligible. The research focused on three hourly categories -- less than 30 hours, 30 to 34 hours, and more than 34 hours -- and in all cases, there was little to no change indicated across comparable quarters. Employees working less than 30 hours per week continued to account for 13 percent of the U.S. workforce, employees working 30 to 34 hours account for four percent, and those employees working what is generally considered full-time, 35 or more hours, account for 82 percent. The research indicates that the lack of ACA impact on part-time employment was also consistent within individual industries. 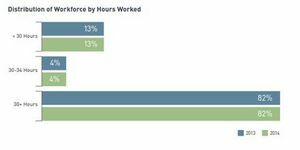 Within each examined industry, the number of employees working between 30 and 34 hours remained steady, ranging between 2 and 4 percent depending on the industry. Overall part-time employment experienced similar stability. The greatest change occurred within the wholesale and retail trade sector, with a 3 percent decline in part-time workers from third quarter 2013 to third quarter 2014. The industry observers' prediction rose from the rationale that employers could benefit from moving workers in either direction. By restricting part-time employees to fewer than 30 hours, it would be possible for employers to avoid offering health coverage, thus reducing costs. On the other hand, employers could maximize labor by moving workers into the 35 or more category. Through this study, the ADP Research Institute sought to provide some clarity regarding the conflicting evidence presented by employer surveys and reports from sources such as the Bureau of Labor Statistics. "The impact of the ACA cannot be considered in isolation from broader economic and demographic changes," notes Christopher Ryan, vice president of Strategic Advisory Services at ADP. "The growing strength of the economy, in addition to the supply and demand of talent, is likely to heavily influence workforce decisions." This notion illustrates arguably the most important takeaway from this study: the potential cost impact of the ACA may not change existing workforce dynamics, but rather it increases the number of factors to be considered in making staffing decisions. The ADP Research Institute used aggregated and anonymous real-world data from approximately 75,000 U.S.-based client organizations. Researchers used payroll data from 2013 and 2014. All the quarters had similar descriptive statistics. The research focused on results from the third quarter of 2013 and 2014 and on changes in hours worked in the third and fourth quarters of 2013 and 2014, respectively. To maintain consistency and accuracy, a matched sample was created ensuring three consecutive quarters of employment. The study captured information from approximately 10 million active hourly employees working for a single organization having 50 or more employees. 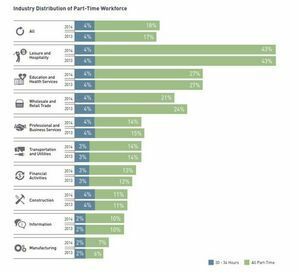 By leveraging actual data representing multiple industries across all 50 states, the research presents a snapshot of the part-time workforce and provides valuable insights. The ADP logo, ADP and the ADP Research Institute are registered trademarks of ADP, LLC. All other marks are the property of their respective owners. Copyright © 2015 ADP, LLC.